Each Sunday join us at 8:30 AM for Donuts and Coffee in our beautiful fellowship hall. Sunday School is held at 9 AM. There are a variety of different classes for all age levels, we are happy to help you find the class that is right for you. The morning worship service begins at 10 AM. Clyde FUMC offers a traditional worship service including shared prayer time, children’s message, scripture and sermon, responsive readings with hymn music accompanied by piano and more. Holy Communion is served on the first Sundays of each month by the music notation. Service length is 60-75 minutes. Wednesdays are filled with a variety of activities. Our children’s ministry team hosts Kingdom Kids during the school year from 3:30 PM to 5:30 PM. Transportation from the elementary and/or intermediate is available. The children receive a snack upon arrival and then rotate to various classes with their age group. The Kingdom Kids program teaches honor, respect, love and most importantly how to be a disciple of Jesus. Please contact our children’s director, Morgan Ramos, via email at children@clydefumc.org for additional information. Our music ministry fills the halls on Wednesday evenings with the beautiful sounds of music. The Handbell choir meets from 5:30 to 6:30 PM and the Sanctuary choir meets from 6:30 to 7:30 PM. Both ministries perform on various Sundays, for special events and different holidays throughout the year. Their music glorifies God in numerous ways as well as blessing our congregation. For more information or to join either choir please contact Jared Reiff at music@clydefumc.org. Clyde FUMC invites you to come and worship with us. See you at the altar! The first members of the Methodist Church of Clyde may have come from a congregation meeting southwest of the present-day town. As early as 1884, Methodist families met at "Hubbard Timbers" and were organized into a local church with Brother Thompson as their first pastor. The church at Clyde probably began to be organized in 1900 or 1901. In July of 1903, the Clyde congregation was incorporated into the Abilene district of the Northwest Texas Conference. Charlie Young was pastor. B.C. Clemer donated land for a new church building and the members built a white clapboard structure in 1904. 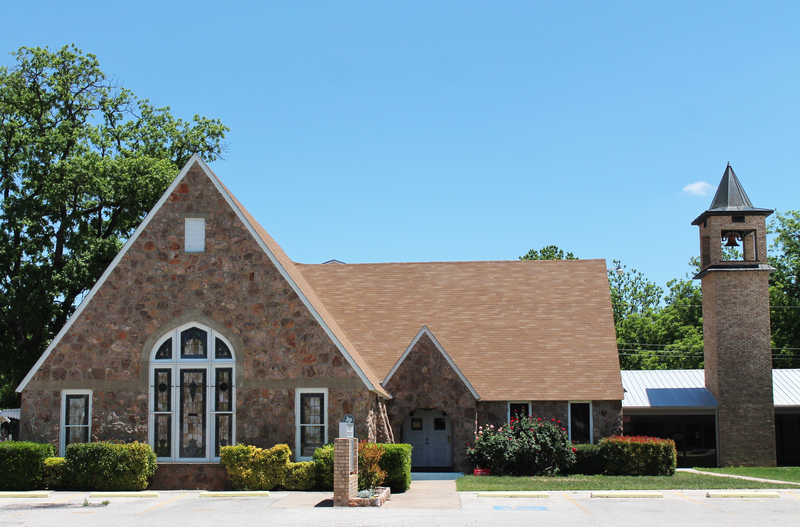 Membership grew rapidly and by 1910, Clyde was the largest congregation in the Abilene area with 425 members. The sanctuary, which held 100 persons, proved too small, so in 1936, a building committee under the leadership of Mrs. P.C. Steen, designed a new sanctuary. Church members built the new structure with rock from the Berry ranch. A Sunday School wing was added in the 1940's and a children's building in 1956, under the chairmanship of Harry Steen. Lee Crouch was the pastor. In 1961, the old parsonage was torn down and a new brick structure was built by Ed Craig for $14,500. Weldon Edwards was the building chairman for the project and Merrill Abbott's family was the first to enjoy the new parsonage. The sanctuary was renovated in 1970 and enlarged to seat 250 persons. Bishop Alsie Carlton broke ground for the new Fellowship Hall in 1977, and Thelma Berry served as chairperson of the building committee. Bishop Louise W. Schowengerdt, District Superintendent Darris Egger, and Pastor Danny Whitehead presided over the dedication service on March 15, 1981. In 1987, two memorials were added to enhance the beauty and usefulness of our facilities. A stately bell tower, housing the original bell from the 1904 church and a Schumerich carillon, was dedicated in memory of David Edwards. A lighted sign with marquee was given by Olaf South in memory of his wife, Amy. In the same year, a building marker was dedicated for our sanctuary from the Texas Historical Commission. The church is also listed in the National Register of Historic Buildings. Monty became our pastor in June of 2013. He and his wife, Ashley, along with their three children, Hannah, Caleb, and Hope, moved here from O’Donnell, where Monty served the O’Donnell and Draw United Methodist Churches for four years. Prior to this, Monty served the churches in Throckmorton and Elbert. Monty attended Asbury Seminary from 2002 through 2006. Monty and Ashley both are graduates of Texas Tech and their children know the words to the Red Raiders fight song! The Barnetts have enjoyed their time in Clyde, with their two dogs, Zoey and Zachy, and their 5 hermit crabs. They have been a part of church camp at Camp Butman since 2007. Hannah and Hope love gymnastics and various forms of artistry, and Caleb will chase the ball of whatever sport is in season. If you need to know what is going on at church, Jessica is the one to call. She came on staff in January of 2014 as Administrative Assistant and Financial Secretary. Jessica spent several years at Blue Cross and Blue Shield as a Customer Advocate. She left BC/BS to become a stay-at-home mom to Mackenzie and Madison. Jessica enjoys volunteering in various areas of the church such as preparing meals, participating in Youth and Children activities, and playing in the Bell Choir. Jessica stays busy blessing people in many ways. 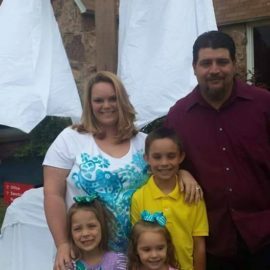 Jessica is married to Donnie Fry. 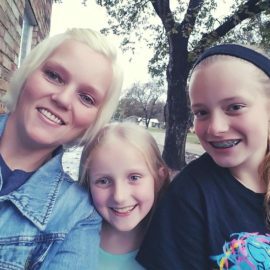 Together they enjoy spending their time watching Mackenzie and Madison grow into incredible little ladies and participate in a variety of sports, church and school activities. Raised in Clyde with many wonderful memories of Vacation Bible School led by her grandmother, Loisteen Mays, at this church, Morgan brings a combination of fresh ideas and strong connection to our heritage to the Children’s Ministry. She loves building teams to accomplish cool new ideas and is always looking for folks who want to serve in important ways in the lives our kids. Morgan is married to Tony Ramos, and is the SuperMom of Isak, Amya, and Meliaha, who keep her busy with sports, cheer, singing, and making new friends. 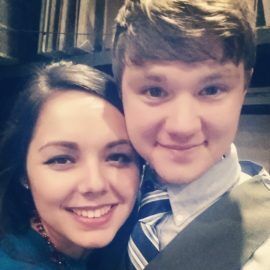 Jared Reiff is a recent graduate of Hardin-Simmons University, earning the Bachelors of Music degree in 2014 and the Masters of Music degree in Choral Conducting in December 2016. A native of Arkansas, Jared currently lives in Abilene with his wife, Alex, who is a prominent middle school orchestra director in town. They share their home with two adorable dogs, a chihuahua-terrier named Moose and a small chocolate poodle named Bear, who make sport of being lazy. Jared is a member of many professional organizations which include the American Choral Directors Association, Texas Choral Directors Association, and Texas Music Educators Association. As a performer, Jared has conducted the Historic Paramount Theater’s Summer Musical productions of Les Miserables and Into the Woods. In 2013, he was selected as a student conductor for TCDA and performed at the annual conference in San Antonio that year. His other conducting experience includes his service as a former student director of HSU’s Upbeat! a cappella choir, and he performed as the Assistant Conductor for Hardin-Simmons Concert Choir and University Chorale. He has performed here in the U. S. in states such as Texas, Arkansas, Missouri, and Oklahoma, but also abroad at European venues in Ireland, Scotland and Great Britain. Jared is excited about the ongoing music and worship ministry of the First United Methodist Church in Clyde, whose emphasis has been on choral traditions and musical excellence. He looks forward to upholding the historic musical traditions of the church while also developing newness in the context of today’s worship. He is currently in the process of writing a book about shoe-tying technique, and intends to have it completed by the end of 2018. After several years in the ministry, Jared would like to pursue the D. M. A. degree and intends to pass along his knowledge and experience as a conductor and a church musician by teaching higher-education music. After completing her Masters in Secondary English Education in 2009, Erin taught at the middle school level for two years in Syracuse, New York. When she and her husband Sean married in 2011, they took a leap of faith and moved across the country to San Antonio, Texas. Erin taught 8th grade English in San Antonio while serving as the Assistant Youth Director at St. Mark’s Church for almost five years. 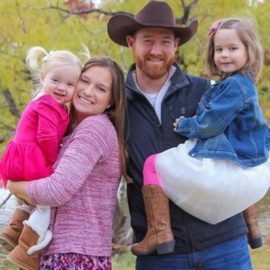 In November of 2015, Sean’s company offered to transfer him to Abilene, and they decided that it would be the perfect opportunity for Erin to take some time off to stay home and raise their two young girls, Hayden (4) and Maizey (2). They moved to Clyde in January of 2016, and have loved getting involved in this beautiful little community, and planting their roots here. 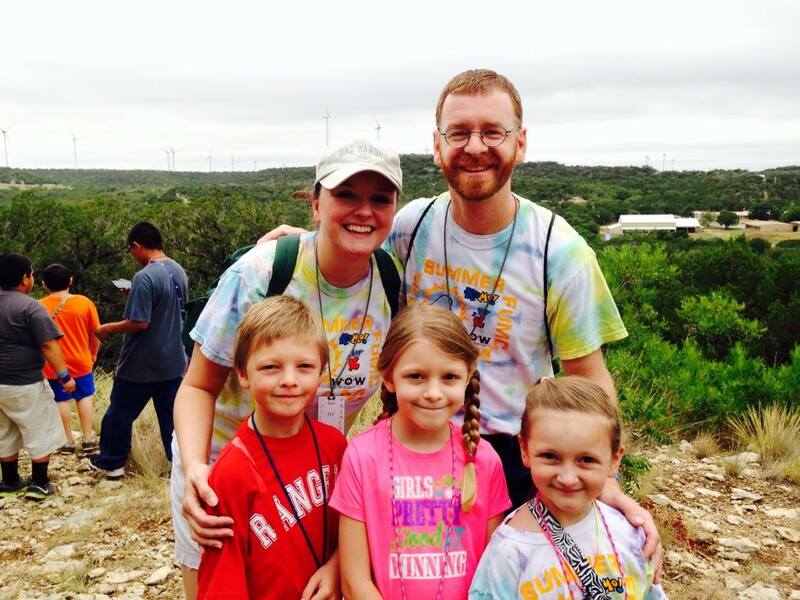 Youth ministry has been Erin’s passion since she was a youth herself. She always sought out ways to bring her friends closer to God through retreats and Sunday School. In high school, she planned and coordinated a middle school youth event called New Beginnings, and served as a counselor at Happening and various other events and church camps. Erin continued serving as a counselor, Sunday School Teacher, and weekend advisor/sponsor for New Beginnings and various other youth activities throughout college and graduate school. She strives to empower youth to discover and utilize their own gifts as they grow in their faith, and to be an example of faith and love to everyone she meets. In her free time, Erin enjoys running (currently training for her second half marathon), cooking, baking, and enjoying the outdoors with her family and friends. She loves adventure; she and Sean met while teaching snowboarding at a ski resort, and they spent their younger summers on the water, skiing, wakeboarding and swimming. They have dreams of traveling the world some day, but love soaking in the Texas sun, and hanging out in their back yard, watching Hayden and Maizey play.